After more than six decades of internal armed conflict, the next four weeks could be decisive for Myanmar’s peace process. 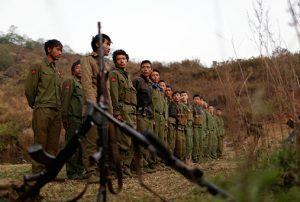 The process, which was launched in August 2011, enjoyed significant initial success, as bilateral ceasefires were agreed with more than a dozen ethnic armed groups. But signing a nationwide ceasefire and proceeding to the political dialogue phase has been much more difficult. Four years on, with campaigning for the November elections already underway, a deal remains elusive. It is unclear whether a breakthrough can be achieved before the elections. Outside pressure will not be productive, but the progress to date needs to be locked in, and public international commitments to support the integrity of the process and stand with the groups that sign can now be of critical importance. A delegation of ethnic armed group leaders met with President Thein Sein in Naypyitaw on 9 September, in what was widely seen as a last-ditch effort to sign a ceasefire agreement before the elections. While both sides showed flexibility and avoided deadlock, no conclusive agreement was reached. Further discussions among armed group leaders and with government negotiators will be needed to determine which groups will sign and to fix a date for the ceremony, foreshadowed for early October. Hopes had risen on 31 March 2015, when negotiators finalised and initialled a proposed agreement that had been approved at the highest levels of government. However, a summit of armed group leaders rejected it on 9 June, proposing several further amendments and establishing a new negotiating team. They also decided that no group would sign unless all did, including three currently fighting the military in the Kokang region, who, the government insists, must lay down their weapons or agree bilateral ceasefires first. Despite this, both sides subsequently worked hard to revive the process, and two further rounds of talks were held in July and August. A slightly revised ceasefire agreement was finalised, leaving the issue of which armed groups could sign the text as the last significant point of contention. Some armed groups signalled their willingness to sign, while others stuck to their position that any signing must be inclusive. The meeting with the president was intended to forge a compromise to overcome this last hurdle. But despite long and detailed discussions, doubts persist about which groups will sign, and when. Key will be the Kachin Independence Organization, which is in a particularly difficult position; a bold decision and strong leadership will be required if it is to overcome its concerns. What transpires in the peace process has important implications for the elections in ethnic areas. A nationwide ceasefire would boost trust between the armed groups and the government. The lack of a deal would make it significantly more challenging to arrange voting in conflict-affected areas and mean polling is likely to be cancelled in more places, increasing the risk of clashes or electoral security problems. In addition, persistent legal restrictions regarding the election commission and political parties’ engagement with armed groups make it much harder to create the conditions of trust and security needed for credible, peaceful elections in areas they control or influence. Medium- and long-term consequences are potentially extensive. If no deal is reached in the coming weeks, it will be many months before the peace process can be reactivated, and it is unlikely the text can simply be dusted off and signed. Many of the obstacles will remain: a mutual trust deficit and ongoing fighting raising further doubts. There will be an inevitable change in interlocutors, since the new administration will likely appoint a new lead negotiator, a military reshuffle has seen senior officers involved in the process retiring, and there will undoubtedly be new legislative representatives. Progress at that point is unlikely to be quick or easy. This is not a perfect or even strong ceasefire agreement: military issues such as force separation, demarcation and verification are vague, not included, or require further agreement to come into force. It nevertheless represents a major success given the complex situation. If signed, it could pave the way for a more comprehensive political settlement. If not, the risk is that an inevitable loss of momentum in the peace process could precipitate an upsurge in armed clashes and less effective means to de-escalate them. Fighting in Shan and Kachin states and pockets of Kayin state could intensify and spread, possibly setting the process back further. Rising Burman Buddhist nationalism and the demands of a majority Burman electorate could also make it difficult for the next government to offer as many concessions. The peace process is home-grown, without any international mediators, and it should remain so – this has been one of its great strengths. But the international community has been providing advice, and now is a critical moment for it to take a public stand – not in terms of pressure on the armed groups to sign the agreement, but rather public assurances of continued political support, close scrutiny of the process and appropriate assistance to affected communities. As one of two formal observers to the process (together with China), the UN has a particularly important opportunity, and obligation, to act. Otherwise, there is a real risk that the best chance in over 60 years for a negotiated political settlement could be lost. This would not mean a return to the widespread insurgency of decades past, which is politically, economically and militarily unsustainable for many groups. But it would mean deep grievances remain unaddressed, borderland insecurity and militarisation persist, and the state-building project remains incomplete. All sides must work to avoid such an outcome, which would be to the great detriment of the whole country and all its peoples.